Rock climbing in Trieste goes back a long way: generations of climbers have sped out to the nearby hills immediately after work to enjoy the limestone delights of Napoleonica, Val Rosandra and Costiera, and many, like Emilio Comici, have left their mark for others to enjoy and test their skill. 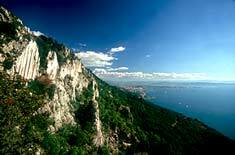 One of the most famous crags near Trieste is the nearby Napoleonica; perched on a hill overlooking the city and its bay, this panorama is Italy's answer to Montecarlo. Costiera is another small crag of considerable value: steep overhangs and fierce slabs combine above the water's edge to ensure a fantastic day out, before watching the sun go down and retreating to one of the many famous trattorie for a well-earned evening's meal. If you are after a combination of tradition and relax, testpieces and trattorie, then come to Trieste. She won't disappoint. All sectors face southwest and receive the sun from 11/12.00am onwards. The best time of year is therefore spring, autumn and winter. The routes are well-equipped with resin or stainless steel bolts and abseil chains. Trieste is situated in the extreme NE of Italy, on the border with Slovenia. 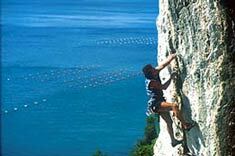 The most recent guidebook to the climbing around Trieste is 'Arrampicare senza frontiere' Trieste - Ospo - Istria, ed. Sidarta. This and updates can be bought at Papi Sport, at Prosecco.